If you’re into night photography or astrophotography, you’ve likely already encountered the scourge that rapidly puts an end to any photo session – dew. It’s a problem that has plagued night photographers and astronomers since these pursuits have existed. Over the years, many techniques and products have been developed to help combat this problem. Many are quite effective, but have their drawbacks. The most often used dew solution is electric heating strips. Dew strips have long been a favourite of amateur astronomers, and for good reason; they work. However, they tend to require a fairly hefty power supply to power long term in the field. Many amateur astronomers will already be carrying around hefty power packs to power their telescopes, so in those cases, it’s not really an issue. For landscape astrophotographers or deep sky imaging with a DSLR using a sky tracker, lugging around a large, heavy battery to power dew heaters is impractical and in some cases outright impossible. One highly effective method of keeping camera lenses dew-free is using chemical hand warmer packets. These little packets are readily available in most sporting good stores or large chain outlets such as Wal-Mart. They’re relatively cheap at around $1.50 per pair (in Canada), or even cheaper when bought in bulk packs. When attached to a lens using rubber bands, tape or velcro straps, they work very well at combatting dew. The downside of using this method is that much of the heat generated from the hand warmers is dissipated to the atmosphere and you have to replace your hand warmers every few hours to maintain effectiveness. If shooting long exposure deep sky images or long duration time lapse sequences, this isn’t very practical. And there’s also the waste factor involved in going through multiple hand warmer packets over the course of a night. Enter the LensMuff from Digital After Dark. It takes hand warmer dew control to the next level, all at a great price. 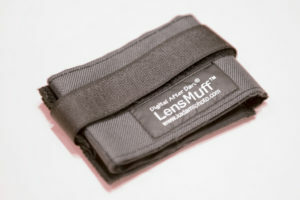 The LensMuff is a lightweight nylon sleeve designed to hold hand warmer packets and then wrap around you camera lens. Folded up, it’s about the size of a man’s wallet and quite thin, meaning you can store it pretty much anywhere in your camera bag, accessory case, or even in your pants pocket without it being in your way. Opened up, it’s about 30 cm long and reveals 3 pockets that neatly hold 1 hand warmer each, although I find that 2 hand warmers are usually adequate. 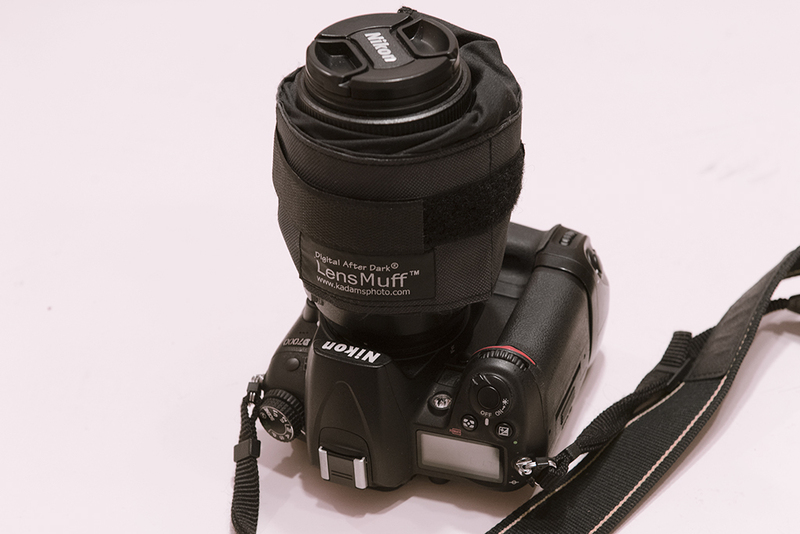 Once the handwarmers are inserted, it neatly wraps around your lens and is secured in place by a velcro strap. Because it wraps around the hand warmers, it traps in the heat in and prevents it from bleeding off into the surrounding atmosphere. This raises the efficiency of your hand warmers significantly and conducts the heat to the lens where it’s needed. The result is a pair of hand warmers can last you an entire night rather than just a couple of hours. When your photo session is over, it folds up easily for easy storage. 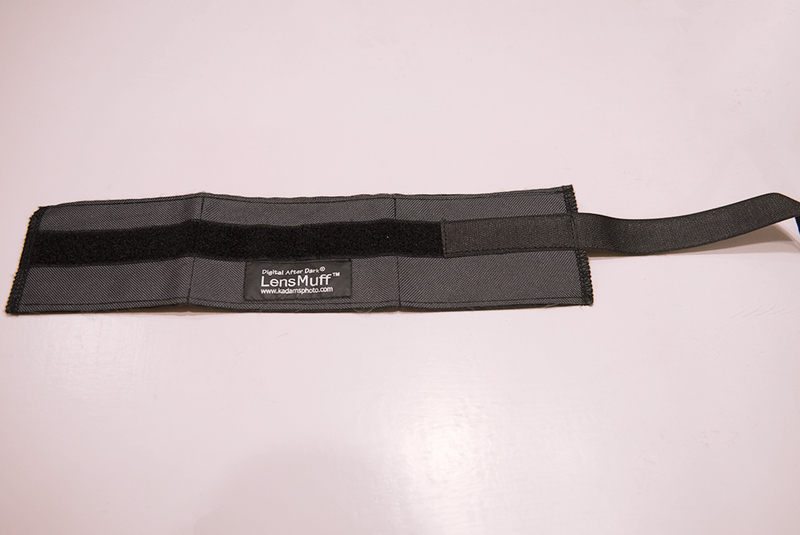 While great for camera lenses, the LensMuff is extremely versatile. While primarily designed for camera lenses, it can be used to keep all kinds of optics dew free. You can easily wrap it around telescope’s finder scope or larger eyepieces like wide angle 1.25” and most 2” oculars. It’s large enough that it can be wrapped around the objective of telescopes up to 90mm in diameter, so for anyone using a small refractor or a guide scope, this is an excellent dew control solution. For larger size instruments, multiple LensMuffs can be daisy-chained together to accommodate telescopes of any size. Two LensMuffs and 6 hand warmers will easily fit around an 8” Schmidt-Cassegrain telescope and keep your corrector plate dew free all night in the most humid of conditions, even without a dew shield. Construction quality of the LensMuff is top notch. The product is hand-made in the USA of quality materials. The nylon is tough, yet lightweight. The stitching is of excellent quality, and overall construction is solid. So confident is their creator that the LensMuff comes with a lifetime replacement warranty. LensMuff with 2 hand warmers inside wrapped around a camera lens. I personally own 2 of these and they’ve seen significant field use over the last couple of years. I can’t count how many times I’ve been at our local dark sky site and had people packing up their gear because of dew while I continued imaging uninterrupted. This is one very useful accessory that can quite literally last you a lifetime. I can’t recommend it highly enough. Available exclusively online from Digital After Dark at a price of $24.95US, the LensMuff is a simple, inexpensive, and very elegant solution to a rather pesky problem that plagues any night photographer. You really won’t regret purchasing one or more. Do you have questions or comments? Feel free to post them below. It’s been suggested that this review is misleading because it claims that the LensMuff makes hand warmers last longer. I don’t actually say that directly in any way, but I can see how it could be interpreted as such. I’m not changing the actual review, but I thought I would clarify what I meant. The LensMuff doesn’t in any way extend the reaction of the hand warmers. 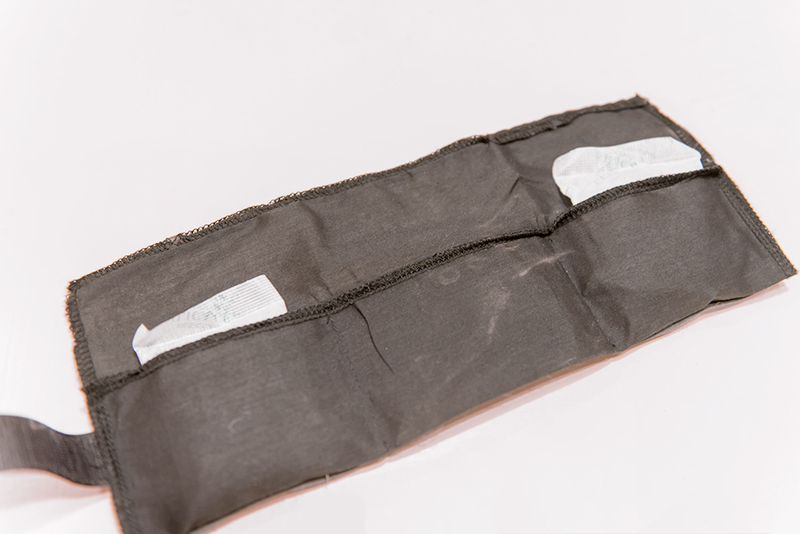 Hand warmers produce heat via a chemical reaction when it comes into contact with oxygen. At the beginning, the reaction tends to produce more heat since there’s an ample supply of reactant available. As time goes on and more of the reactant combines with the oxygen in the air, heat produced diminishes and eventually stops. This doesn’t change when wrapped up by the LensMuff. What the LensMuff does is insulate the hand warmers from the air around them and the diminishing amount of heat they produce is held in and redirected to the lens where it’s needed. After about 2 hours, hand warmers exposed directly to the environment won’t be producing enough heat to prevent dew from forming on a humid night. When wrapped in the LensMuff, that small amount of heat is still adequate to keep your optics dew-free. I get these numbers from personal experience as I started off with just 1 LensMuff, but 2 cameras. One camera would have just the handwarmers held with a velcro strap while the second had a LensMuff. Without failure, after a couple of hours, the one without the LensMuff would start forming dew and I’d have to replace the hand warmers, whereas the LensMuff equipped camera would last an entire 5-6 hour imaging session with a single pair of hand warmers. Effectively, it can double the amount of time that a single pair of hand warmers will remain effective. So it doesn’t extend the reaction produced. It just extends their useful lifetime.